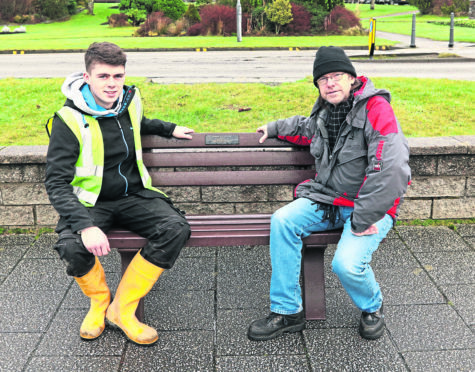 James Emslie (left) from Gaelforce Fusion with David Hobbs and the repaired bench in its new position on the esplanade. A husband has spoken of his sadness after mindless vandals threw a memorial bench dedicated to his late wife over a sea wall, smashing it to pieces. But David Hobbs, 62, has thanked the local Oban community after he received an outpouring of support and offers to help fix it. The bench, with a memorial plaque to Amnuai Hobbs, was installed on Corran Esplanade after her sudden death in 2014 aged 41. Situated across from the Regent Hotel overlooking the sea, the seat, which took two people to lift, was thrown over the railings onto the beach, a 10ft drop below. Mrs Hobbs, who was originally from Thailand, worked as a public toilet attendant at Oban’s North Pier and was a popular figure in the town. Now Fusion Marine, which originally made the bench for Mr Hobbs, has fixed it free of charge. Mr Hobbs said: “She used to sit down there in the summer. She worked for the council and used to do the toilets at the North Pier. He added: “On Tuesday I came home and was told the bench had been thrown over the sea wall and broken. 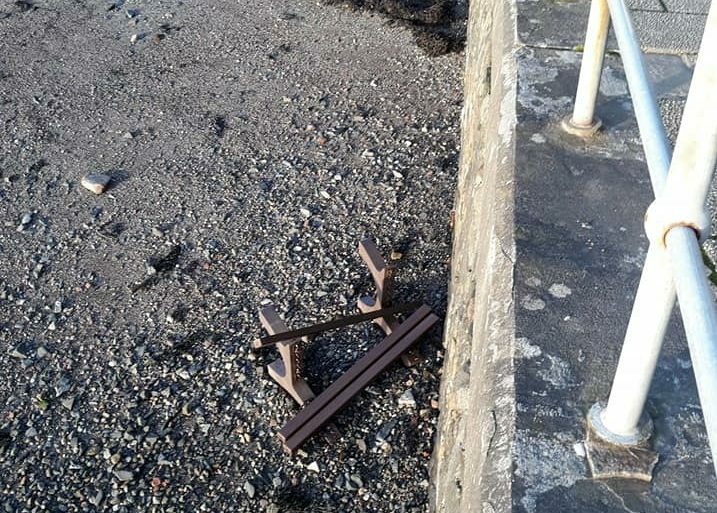 The memorial bench smashed to bits after being thrown over a sea wall. “There were photographs on Facebook and I could see straight away it was going to be difficult to fix. “A local man I don’t know called Davie offered to help me and the next morning he and I went down to collect it. Fusion Marine who made the bench said they would take it away and fix it free of charge, which they did. “I feel angry but I don’t feel any hatred to anyone. Amnuai wasn’t that kind of person. She didn’t have a bad bone in her body. I would like to think that when the bench is fixed, whoever did it might put flowers on it instead of damaging it. “It brought everything back. I have never really got over her death but I have learned to live with it. The bench is being put back on the Esplanade, closer to the Corran Halls and a greater distance from the sea wall. A police spokeswoman said inquiries are continuing and appealed for anyone with information to call 101.